Whoops, made a mistake? Lost the item? Here's how you can end the listing! If you are looking to end a listing, this article will show you how to do so in a few simple clicks! 1. Open your Listings page. 2. Select the listings you wish to end and then click on the "END" button to the right of the "PICK A TEMPLATE" button. 4. 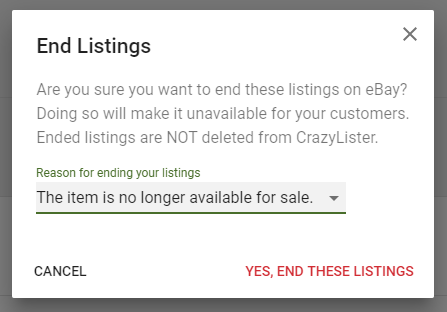 Pick the reason for ending your listings from the drop down menu. 5. Once you are ready, click on "YES, END THESE LISTINGS" to end the listing/s. Now, the listing will be removed from your ''Active'' section and moved to your "Ended" section. tags: end, end listing, remove, bulk end listing, end multiple listings, remove multiple listings, end listings on ebay.